My relationship with Reckoning began roughly twenty years ago via a dubbed cassette copy I recorded off my friend’s older brother’s vinyl LP. The flip side of the tape was Lifes Rich Pageant. I still have the cassette, the sleeve’s paper yellowed and stained, with the track titles written in the hand of a 13 year old boy. The red ink is a bit smeared and runs in places, and the cassette itself sounds a bit warped and thin. It is seasoned in the way only an album that has been played hundreds of times, in hundreds of places, can be. To say that my “getting into” R.E.M. at the beginning of my teenage years was revelatory would be an understatement. This was, after all, the late eighties in suburban Atlanta. Prior to this my musical diet primarily consisted of my parents record collection, whatever was on the radio, some Guns ‘n Roses (Appetite), Beastie Boys (Licensed To Ill), Run DMC (King of Rock) and select bargain bin finds like Zeppelin, and other ‘classic rock’ staples. Looking back, IRS Records-era R.E.M. was an absolute gateway band. It wasn’t long before my tastes expanded and I ditched the music of my parent’s generation (well, for a few years anyway) quickly getting my hands on everything I could find by the Pixies, Smiths, Devo, the Cure, and Violent Femmes. The majority of this purloined by said friend’s older brother’s collection and dubbed to cassette. Lately I’ve been listening to, and thinking about, early R.E.M. quite a bit; partly in response to this latest batch of reissues. Besides the obvious classic rock touchtsones (Beatles, Stones, etc) there are not many albums/artists that I still consistently listen to that I discovered at age 13. For example, those Dead Milkmen tapes I bought at Turtles Records & Tapes in Dunwoody Village, as nostalgia inducing as they may be, rarely get broken out. Same goes for The Hoodoo Gurus and that first Lenny Kravitz record. But album’s like Reckoning are different. Album’s like Reckoning — well, they are truly works of art. And like any art form you develop a connection with, whether a painting or film, it can be taken in again and again. And like all good art, you take something different away from it each time, in every different circumstance you find yourself listening. The tell-tale sign of a classic if there ever was one. Reissue Specs: The two-CD deluxe edition of Reckoning features the original album remastered plus a bonus disc of a previously unreleased concert recorded during the band’s Little America tour at Chicago’s Aragon Ballroom on July 7, 1984 and broadcast on WXRT. On the Deluxe Edition’s bonus disc, the group performs eight of Reckoning’s ten songs, “Gardening At Night” from 1982’s Chronic Town EP and “Radio Free Europe,” “9-9” and “Sitting Still” from Murmur but also new songs that had yet to make it onto tape: “Driver 8” would later debut on R.E.M.’s third album and “Hyena” on its fourth. One of my favorite takeaways from the 33 1/3 installment on R.E.M.’s debut, Murmur, was author J. Niimi’s acute acknowledgment of Michael Stipe’s non-linear lyrics, lyrical style and delivery; and how they shaped the next generation of musicians in a genre that would become known as “indie rock” – – in particular, Pavement. 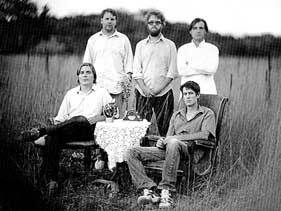 This struck a chord, as when I first discovered Pavement, one of the immediate touchstones was that of Stephen Malkmus’ pointedly casual delivery, and his abstract use of lyrics cloaked in, what to these ears felt like, Stipe-isms. I was hooked. More than hooked, actually. Like Stipe before him, Malkmus has, throughout the progression of his career, moved on to more straightforward lyrical songwriting, and while I’m still an enormous fan, there is something special about the days (of both bands) when you had little clue about what the vocals were trying to impart, or hell, for that matter, even (at times) what the actual words were. I’ve gracefully mumbled my way through many an R.E.M. & Pavement tune, only to years later realize I was completely off base, both lyrically and content wise. Here is Pavement’s ode to R.E.M., “Unseen Power of the Picket Fence,” in which Malkmus, working his way through Reckoning’s song titles, informs us that “Time After Time Was (his) Least Favorite Song.” FYI, “Picket Fence” can now be found on the Crooked Rain, Crooked Rain reissue. Posted on June 25, 2009 June 25, 2009 R.E.M. Loved your post. I was you during that same time. I had the same tape, although it was Murmur/Reckoning and I shopped at the Turtles on Johnson’s Ferry in Marietta. How could I not go to Athens for college after hearing that? Like quite a few other UGA students, I had Howard Fenster’s (RIP) wonderful album poster on my wall as well. While I was living in Athens, my job had a scavenger hunt. One of the items we had to secure was a Reckoning LP. I didn’t have to go farther than my apartment. Too easy. This Pavement song, found on a V/A collection, is, in my opinion the apex of their musical output. The heartfelt honest and the loose power of the music comes together as one. And who cannot laugh at the “Ay, sirs” of poor “southern boys just like you and me… R.E.M.” Classic! You pretty much described what happened to me, albeit in South London as opposed to suburban Atlanta, and also much more eloquently. R.E.M. was my gateway band to a smorgasbord of alternative music. Thanks for making me relive many happy memories of high school when my friends and I would skip class and share listening to Reckoning on one Walkman. I *really* enjoy your blog – it is more personal and in depth than just showcasing MP3s from the latest and greatest, like many other alt music blogs out there – it has been inspiring me for over a year now. Keep up the good work. I too still have the cassette copy of Reckoning that I dubbed off of my stepfather when I was 15. I have no cassette player but I still have the tape. You know, back in 1986-90 I would’ve said that Life’s Rich Pageant or Document was my favorite of their output thus far. The past few years though, Reckoning is the one I pop on from time to time. Nice post. I had heard Chronic Town and Murmur but Reckoning was where I felt like I understood the songs even if I didn’t know what the words meant. The b-sides were great. They liked the Velvet Underground too! Do we really need a Deluxe Edition of this? The IRS Years reissue was just fine and I’m still looking for the Mobile Fidelity CD. And even though their last album, Overrate, I mean Accelerate wasn’t that great, I reckon I’d rather listen to my least favorite REM songs than Pavement anyway. Wow. Will all the mid-30-somethings please stand up? Great post…like many other commenters, I had a similar experience. R.E.M. was the first band that was “mine,” in that my friends weren’t into it, my parents didn’t get it, and I loved them. I started with Green, bought Murmur and Reckoning next, and was hooked. Their catalog is always on my player, and I agree they stand the test of time far better than many of their peers. Great post. Totally used to shop at the Turtles in Peachtree Corners before they closed it down. Had a similarly worn out tape of a show REM did at Lakewood right after Up came out. If I remember correctly they broadcast it live over 99X. Amazing stuff. Reckoning is the album that got me into R.E.M. Like you, it is one of the few from that era that I still listen to with any regularity (I’ve got Beelzebubba somewhere down in the stacks as well). I picked up Reckoning the day it came out, my junior year at UC Santa Barbara. I had listened to Murmur and Chronic Town to death by that point and was dying for anything else from the band. After listening to the album a dozen times, the songs were stuck in my head. Most notably, Harbor Coat. That same week the album came out, I remember studying in a cubicle at the college library and scribbling in very small print on the desk: “Please Find My Harbor Coat”. That was it. One small piece of graffiti on a white desk on the 7th Floor of the UCSB library. A small piece of code from a band I loved. I returned to the 7th floor two nights later, and managed to secure the same coveted study spot. My lyrics were still there, but someone had added the next line: “Can’t Go outside Without It”. Felt like I was part of a secret club. It was a small, powerful moment. Thanks for triggering the memory. Great post. I too remember when Reckoning came out (some of us are in our mid-40s here! ), in school at the University of Utah…it was a link to the world outside of the “Zion curtain”. Like Kyle (above), finding another REM-head was like having a secret club. Lost my 4-track tape years and years ago and recently (cough, cough), er, bought it on iTunes, which may be akin to blasphemy. But it still sounds amazing and brings back great memories. To think that I once owned this album, and then sold it ! What the hell was I thinking of ? Still the great beauty of hindsight is you can correct previous mistakes, and although it has taken me twenty six years to realise it, this is a great record. Excellent post! Good God, man, did we know each other in high school? Or did I have the same musical experiences as thousands of other suburban Atlanta teens in the late ’80s-early ’90s?